Great Reports from Daniel and Lily Kizhakkevila in India! 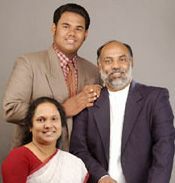 Daniel and Lily have completed three Pastors Conferences and Evangelical meetings in Kerala and Andhrapradesh. The week before he held a Pastors Conference and Evangelistic meetings for three days in Hyderbad where 200 pastors attended the Conference. For many this was the first time they had ever attended such meetings. Night meetings were attended by 1000 people. Daniel says "God's hand moved mightily. Many were healed. Fifty-five people were saved and sixty-two were filled with the Holy Spirit." God has opened the borders of Andrapradesh and Orissa for Daniel to plant churches. "We found seven missionaries working in those areas independently with no support or help from any one. Their lives are in utter poverty. Hardly anything to eat. I felt very sorry for them. We have taken them under our wings." God has also opened some doors in Bidhar District. Eight missionaries are ready to go for church planting in this area. "At Bhel area we have taken five more new missionaries. So altogether we have taken twenty new missionaries for the month of April. I see sixty new churches being planted with in the next three months in these villages."